Three weeks into the release of Amonkhet, the latest Magic expansion, competitive play is tormented by an overpowered combo that players hate for making games feel less strategic and more like spinning a roulette wheel. 2017 has seen more cards banned from Magic’s Standard format than in the past ten years combined, but many pros find today’s popular gameplay strategy boring enough to demand that yet another card get the boot. 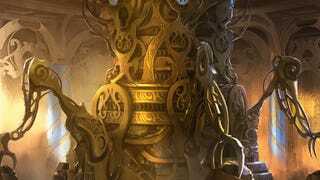 Shortly before Pro Tour Amonkhet, the Spring season’s major tournament that took place May 12-14, a broken combo deck called Copy Cat was emergency-banned out of the Standard format. Its unmatched power dominated tournament play and flattened the competitive viability of other deck types. Itching to pilot decks with other play styles, the Magic community welcomed the ban, though some players feared that the “fixed” format would instead become broken in a different way. This dark prophecy has been fulfilled, but not in the way that the community predicted—it is not Gideon, Ally of Zendikar, a pushed, merchandisable “face card” of Magic, that has torn pro Magic asunder. The new menace deck revolves instead around Aetherworks Marvel. It lets its controller cast random cards off the top of their deck. If that deck’s pilot is very lucky, they can win games very quickly, eliminating the opportunity for players to leverage the technical skill and long-term strategy that make Magic fun and interesting. It is trivially simple to play a Marvel on turn four and activate its ability once, which allows players to look at the top six cards of their deck and then cast one free of any cost. The dream is to hit an Ulamog, the Ceaseless Hunger, a card that both presents an enormous and fast threat and denies the opponent of their best resources. The reason that a card like Ulamog can exist is its steep mana cost, which means players generally can’t use it until their tenth turn. Players using the Marvel combo will win or lose based on the six random cards they can access each time they give it a spin—sometimes you get Ulamog, and sometimes you get nothing. Marvel is not a new card, but it has ascended in power because of the nature of the Standard format itself, the premier format for competitive Magic. Standard is a rotating format where only cards from the past two years are legal. The reason is twofold: a rotating card pool provides players with a reliable influx of new card designs and strategies and challenges players to come up with novel strategies. Of course, it also also enables Magic’s publisher, Wizards of the Coast, to market new products. Because Standard’s card pool is so small, there are usually fewer viable deck types than in other play formats. However, Magic players (like NBA fans) are unhappy when the number of competitive contenders shrinks to a field of one. After Copy Cat combo was banned, Marvel has filled the void at the top, and once again, a single deck with a single win condition is far and away the most powerful option available. When a format is broken and not fun to play, Magic’s governing body at Wizards of the Coast issues card bannings to outlaw the offending cards. Wizards has been in hot water recently because of an excess of bannings in Standard in the past year—if Marvel does get the hammer, it would be the fifth card since January. Stark and Maynard advocate a Marvel ban, but Handy was more hesitant. She explained that bans mean that money players invest in powerful cards can disappear overnight. So, players are faced with two lousy options: “[You have a choice] of ‘play a sub-optimal deck’ versus ‘play the best deck but have your collection lose value when the cards get banned in a few weeks.’” Juza thinks that Wizards of the Coast will likely hold out on bans and instead wait out the three months for Ulamog to rotate naturally, although Marvel itself would remain legal for another year. Wizards is next scheduled to update their ban list on June 14th, and it remains to be seen whether Marvel survives. At least Wizards is putting away their dice when it comes to new card design— players will not tolerate rolling another snake eyes. The evolution of philosophy that led to the establishment of the Play Design group, and the steps to make that philosophy real, have been in the works independent of what’s been happening in Standard currently over the last several months — in fact, its genesis began in early 2016. Having fun play formats such as Standard and Draft have always been essential, and we always spent a lot of time on them, but formats were largely viewed as an output from the focus on set and card design. If we made the best set and cards possible, keeping in mind format requirements, then we would naturally make the best format possible. We recognized there was an opportunity for improvement; to have an entire team focused designing the best format(s) possible, independent of the teams focusing on designing the best sets and cards possible. Rafael is a 6th grade math teacher in Boston, and a competitive Magic enthusiast specializing in Modern. You can follow him on Twitter @shloopu. Can Magic’s Latest Expansion Save A Stale Meta-Game?